VIP Weekend tickets will also be available for $234.50. All VIP tickets include: VIP entrance lanes into venue, access to VIP-only area featuring dedicated bar, beverage and food options (for additional purchase), VIP-only viewing area of Main Stage, dedicated restroom facilities, and a VIP-only commemorative laminate. 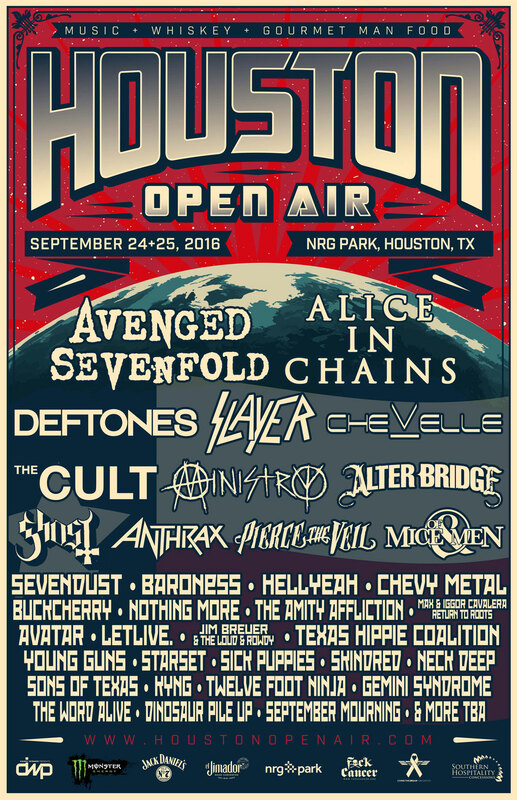 Hotel discounts for Houston Open Air are available through Curadora at: https://curadora.com/events/houston-open-air-2016-219baf2a/. In light of the recent flooding in the Houston area, a portion of the proceeds from all Houston Open Air tickets sold will benefit the Greater Houston Storm Relief Fund. The Greater Houston Storm Relief Fund was established by Houston Mayor Sylvester Turner to accept flood relief donations that will stay in the Houston community and aid the victims of the recent storms. To donate or learn more, visit www.houstonrecovers.org. In addition to three stages of top rock bands, Houston Open Air features the celebrated Jack Daniel’s Old No. 7 Whiskey Row, and a Texas-sized Gourmet Man Food experience underscoring Houston’s emergence as a great American food city. Jack Daniel’s Old No. 7 Whiskey Row will feature the following brands: Jack Daniel’s Black Label, Gentleman Jack, Jack Daniel’s Tennessee Honey, Jack Daniel’s Tennessee Fire, Old Forester, and Woodford Reserve. The full Gourmet Man Food lineup and menus for Houston Open Air will be announced soon. Houston Open Air sponsors include: Monster Energy, Jack Daniel’s, El Jimador, Fxck Cancer’s Dyin2Live, NRG Park and SoHo Concessions, with more to be announced.